Dr. John Peirce, veteran veterinarian, would like you to listen to the perspective of conventional beef producers. So would I. But I would also appreciate it if he himself spent more time listening. To see what I mean, read on. Peirce wants his readers to know “what they don’t tell you” about the U.S. beef industry. 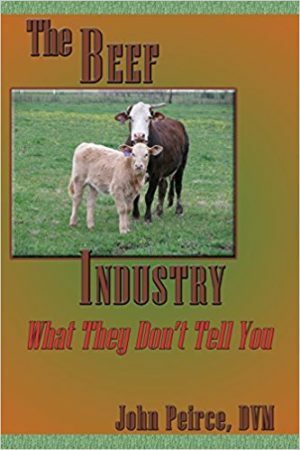 “They” are the industry’s “critics,” “you” are consumers who object to how the industry operates, and what you need to know that they don’t tell you is accurate information about how conventional beef is produced, information that the author believes will lead you to view the industry more sympathetically, maybe even to admire those who work in it. The first forty pages of the book blend autobiography, the history of U.S. beef production, and a description of the problem the author intends to address. He grew up on a ranch and has served beef producers for decades as a vet and consultant. He portrays beef producers past and present as smart, honest, hardworking people who love their work. various environmental issues relating to the industry, including climate change. Peirce argues that knowing about the character of beef producers, what they really do, and why (as opposed to what the media tell us) should lead readers to admire and support them. Unfortunately, “critics” have misinformed many consumers and manipulated their emotions, he says, with the result that they wrongly find fault with conventional producers and instead favor grass-fed, certified-humane, or organic beef. The author believes, therefore, that consumers’ objections to beef industry practices and their pursuit of alternative meat sources are essentially a communication problem. Most U.S. citizens don’t know beef producers, but he does. So if he represents their perspective to his readers and encourages them to research the matter for themselves, readers will come to admire the conventional beef industry and lose their enthusiasm for the alternatives, which to him are merely marketing ploys lacking a solid foundation in good science and good management. that the carbon footprint of conventional beef production is actually smaller than that of grass-fed or organic production. I credit Peirce with enlarging the gray area for me in a lot of the issues he discusses. He speaks from firsthand experience, and I can’t dismiss most of his arguments out of hand on the basis of what I presently know. I also am inclined to believe him when he says the ranchers he’s dealt with have generally been strong, savvy people who care about the well-being of their animals. Yet the book’s argument is weakened by significant flaws. Most notably for readers of The Natural Farmer, the author disposes of the significance of organic beef in less than one page. A few years ago, he considered producing organic beef, he says. When he investigated several organic operations, he “was not comfortable” with what he saw. He didn’t believe animals could be well cared for without practices that are prohibited under organic regulations, and he felt the costs would be too high. Peirce urges his critics to limit their judgments to matters within their own expertise and not judge the beef industry if they don’t understand it. He could have enhanced his own credibility if he had applied that logic to the production of his book, requesting the help of a professional manuscript editor. As it is, the book is very poorly edited and proofread, containing hundreds of avoidable errors. A few examples: wrong word choices (“attain” for “obtain,” “infamy” for “fame,” “populous” for “populace,” “principle” for “principal,” and others), a misspelled chapter title (“Beef Handing Techniques”) and subheading (“Brinining” for “Brining”), closing quotation marks without opening ones and vice versa, hundreds of semicolons where commas belong and commas where no punctuation is called for, dangling participles (“when thoughtfully consumed you will . . .” p. 24). The Natural Farmer readers may wish to read this book to challenge themselves with a perspective different from the kind they get from literature preaching to the choir they already belong to. The voice of conventional beef producers does deserve to be heard, along with all other voices, and we can thank Peirce for slightly amplifying that voice. I only wish that before he had published his book, he himself had really listened to those who know organic farming, and to a manuscript editor.